We have been camping in the desert for few days now. Our rig remains in place, its rear nestled along the ridge of a wash that is surrounded by desert shrub. In spite of the cool weather, intermittent wind and rain, the boondocking experience has been awesome. Our morning routine in the desert. After a few days, we have developed a routine that is working well. In the morning our little home is around 50-55 degrees, so it is a bit cool. The down-filled travasack keeps us warm during the cool nights, but upon rising we quickly turn on the generator and turn up the thermostat to the propane heater. It warms up pretty quickly. By the time we have finished with the morning rituals and the coffee is steaming from the Keurig, it is cozy and comfortable. I enjoy my early morning coffee as if I were sitting home in the comfort of our living room. We run the generator for about an half hour and it keeps the house batteries charged and ready for use the next time. We turn on the mobile hot spot and read from our tablets or work on the blog. The mornings are relaxing and laid-backed and a great way to start our day. Dogs, Cats, and Parrots , Oh My! There are thousands of rigs scattered across the desert and a good many of the campers have brought their pets. When you take a walk and meet someone, they most likely will be walking with their dog or dogs. For many years we have observed that people who camp are animal lovers. Some people bring two or three pets and a mixture of dogs and cats. It all seems to work out and every one is happy. As we passed by one camper, there was a parrot sitting on a man’s shoulder. There is something special about enjoying nature with your beloved pet. The desert land in this area is hard-packed with coarse gravel and large rocks. The harsh terrain makes walking difficult even when you have good hiking boots. It is also hard on doggy paws and they can become very sore. Heidi has been wanting to take short walks and now we know why. Yesterday we walked with a new friend and her three dogs and was joined by another lady and her dog. The dogs enjoyed each others company while each one explored the surrounding smells. Heidi was having a good time walking with her new canine friends, but was ready to get back to camp by the end of the 20 minute walk. Most people have been good about keeping their dogs on a leash, which is actually a BLM regulation. It is a good rule and intended for the dogs safety. It’s a harsh world out there unbeknownst to our canine friends. I was sad to hear that a man camping with another group has lost his dachshund puppy. The puppy ran off into the brush out of fear and to get away from some other dogs. The weary man was driving around on his quad looking for it. Our new friend with 3 dogs went out on her rugged mountain bike with fat tires looking as well. My heart breaks for him and I know if he can take back the moment, he would have had that puppy on a lead. I think about that sweet little puppy a lot and I will keep you posted if I hear anything. We are making new friends and meeting women from all over the western states: Arizona, New Mexico, California, Colorado, Washington, as well as Nebraska, Florida and even British Columbia. Every one is so friendly and we’re all sharing tips and learning about camping and boondocking. They talk about their rigs and often invite you in for a tour. Many women are full timers and have interesting stories about their lifestyle experiences. 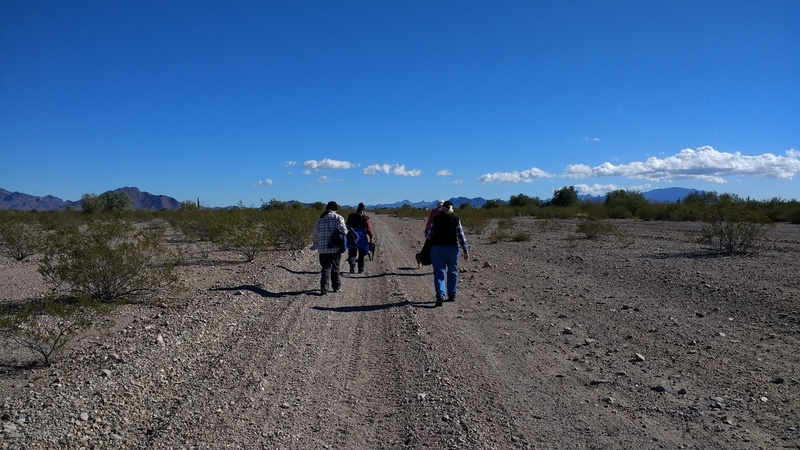 Taking a walk in the Sonoran desert. 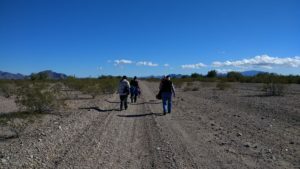 We met a couple of friends from Colorado and took a hike with them through the desert. There are so many roads to walk on, roads that have been made by ATVs. They weave all through the desert and go on for miles. I’m sure one could get lost if you walked far enough. We took a GPS with us not knowing what to expect. As it turned out we walked on a road that borderd the LTVA land. 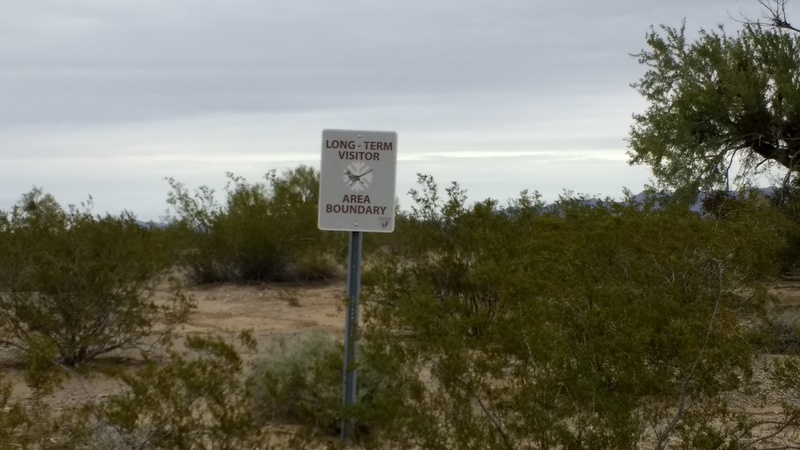 The Long Term Visitor area is BLM land that offers visitors a place to stay for longer periods in the desert. A permit costs $180 and allows you to camp for seven months. They provide dump stations, water, and trash services. I couldn’t stop thinking about the lost puppy, so I walked over to the group camp and asked about him. Luckily the first man I asked filled me in on the details. The story on the lost puppy has a happy ending. As it turned out the dachshund wasn’t a puppy, but rather an adult male. Also, his owner wasn’t letting him run free. The little tike dashed out the RV door and ran like a flash into the desert. They looked for him throughout the day and I guess they probably thought they would never see him again. Around 9:30 at night there was a scratch at their door. What a shock! Not only did he find his way back in the dark, but came right to his house. I imagine that was one happy reunion! This entry was posted in Arizona and tagged Boondocking, Quartzsite, Sonoran Desert. Bookmark the permalink. Awesome…so enjoy your posts. Lee and I have been exploring back roads not far from our Kissimmee house. We are planning a day trip to Crystal River to paddleboard and kayak the spring fed river…hoping to see some manatees. Lida continues to work from home here. Oh yes, Crystal River – that was a great video you guys did last year. We would love to do that trip some time and see the manatees up close. You guys sure know how to have a great time! Yes … I also am enjoying your blog. You will both be seasoned camper by next summer beach time … not that you weren’t. I’m in Gordon and Lida house in Florida … leaving Thursday to the east cost for 2 days and then to Fort Meyers Beach to see my sister and friends … then to Treasure Island for Kite Fly #2 for almost a week … Stephanie is joining Me Feb. 7 and we are going to explore central Florida … esp. the springs. Enjoy you camping and keep on writing! Thanks for following us. It sounds like you’re having a great time this winter as well. Say hi to Stephanie for us. Keep on flying!